This month I'm participating in the Ultimate Blog Challenge! It's a way to connect with fellow bloggers and increase your traffic (and theirs!). If you haven't signed up already there still could be time. For this recipe, I used my mother's apple pie filling and cut the ingredients in half. I also decided that because I'm still trying to control my weight, I wouldn't fry the rolls. I know typically egg rolls are fried, but I thought they still would turn out ok if I baked them. Turns out I was right! These are great. I would definitely make them again. I may use a sugar free sweetener in the future just to see if that would work out but these are good as is. It's funny how sometimes I think I have this novel idea but then when I type it into google, at least a hundred entries pop up. That's what happened with these. I should have known! Here are the egg rolls right before I put them in the oven. 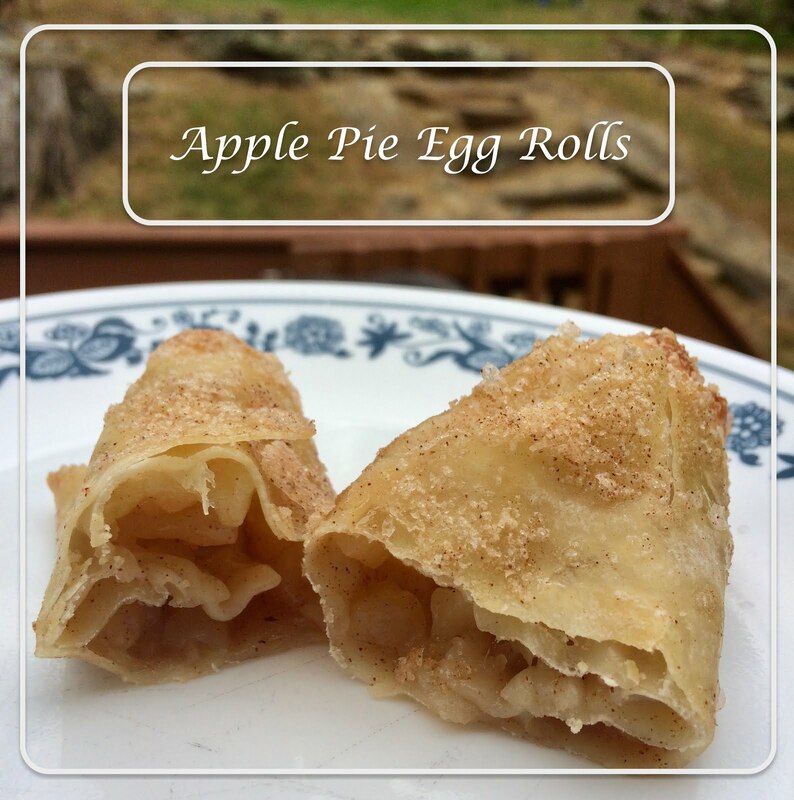 I put around 2-3 tablespoons of apple pie filling in each one, wet the roll with my finger and then wrapped it up. Then I dampened the egg roll with water and rolled it in cinnamon sugar. Preheat oven to 350 degrees. Spray a cookie sheet with nonstick spray. Mix all filling ingredients together in a medium-sized bowl. Place 2-3 tablespoons into each egg roll wrap. Moisten edges of wrap and roll. Then roll finished egg rolls in cinnamon sugar mixture. 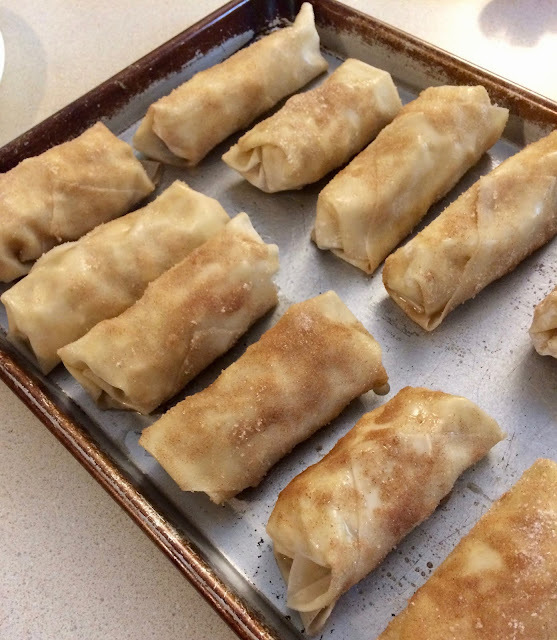 Place egg roll on cookie sheet and repeat until all filling is gone. Bake for 20 minutes or until egg rolls are slightly browned. Makes about 12-14 rolls. 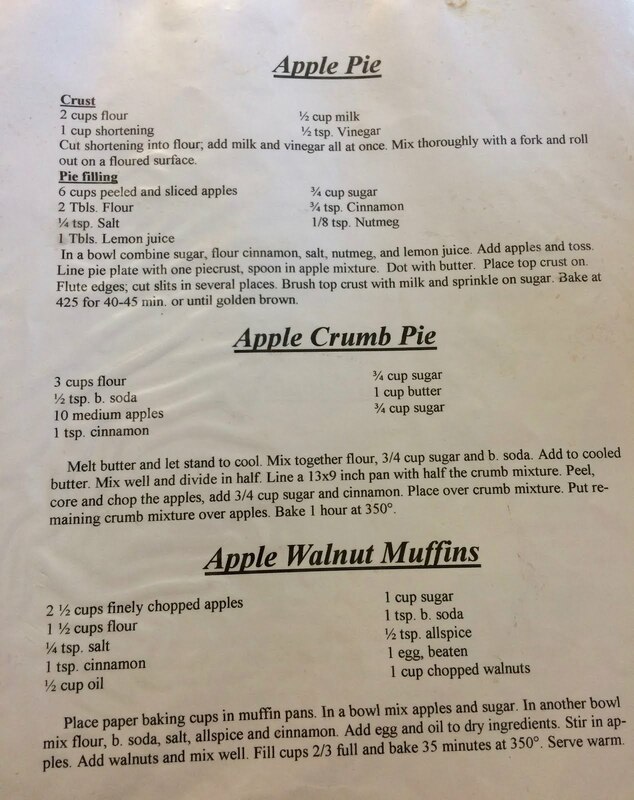 Here is a picture of the page in my mom's recipe collection where I got the apple pie filling recipe. If you can zoom in, you'll see a recipe for a delicious pie crust. It sure does have a lot of shortening, but it's so worth it for the occasional treat. Thanks for reading and check out the links below!